When it comes to helping move the field of early childhood education (ECE) forward, a Denver nonprofit is making huge strides – in the city, the state and even the nation. Clayton Early Learning is a longtime Rose Community Foundation grantee that got its start more than 100 years ago as an orphanage in Northeast Denver. Since 1996, the Foundation has provided more than $2 million to support programs and initiatives at Clayton. Today, families throughout the area know Clayton for its Educare Denver school, recognized as one of the top Head Start programs in the nation. The school is a vibrant, engaging place that each year is making a difference in the lives of hundreds of young children from birth to age five. Most are from low-income families; children who, according to well-documented research, often start kindergarten lagging far behind their more advantaged peers and have difficulties catching up. Clayton’s Educare Denver is successfully closing that gap. Clayton’s reach goes far beyond the school grounds. 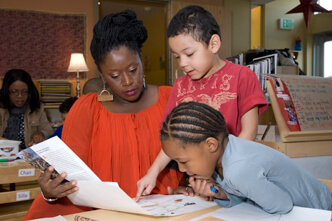 The organization has become a nationally recognized expert on ECE as well as the premier training and research center in the state – all thanks to its unique model that intertwines the concepts of practice, research and training. At the center of it all is a robust research institute, which Rose Community Foundation helped start and continues to support. Clayton’s research institute focuses on identifying and evaluating the most effective practices for ensuring kindergarten readiness. Clayton’s direct classroom and family programs effectively serve as a proving ground for testing, evaluation and refinement. Best practices in professional development are then shared with child care providers, professionals and universities through coaching, training and curriculum development. In 2012 alone, Clayton trained and coached more than 2,500 ECE professionals in the state. Those professionals will go on to effectively teach thousands of children year after year. Clayton Early Learning is a crucial partner in a long-term vision to ensure school readiness for all Colorado’s children, and Rose Community Foundation is proud to support its efforts.